Tramp Preachers’ Defence - Decoying Girls Abroad Stoutly Denied. NOTE TO READERS: There are several noticeable discrepancies when the Testimony of Lizzie Coles is compared with a 1906 newspaper interview with Lizzie Coles' father, and other document ation about the Coles family history, the 2x2 church and workers. Details are provided in the Footnotes. Also Known As "Lizzie" and "Lily"
Mary Elizabeth Coles: born April 5, 1878, Cornwall, England. It is not known when the family moved from Cornwall to London. What is known, is that her parents, John and Mary Coles moved into a two or three story brown house in a residential part of London, very near to the slums in which John preached. You see, he felt it was his calling from God to work among London's poor slum dwellers to give them a little light in their otherwise bleak lives. Mary, or Lizzie as they called her, was the eldest daughter in a family of eleven children. Her brother, Charles, was one year older than she was, and almost yearly, came nine other boys and girls. Three of them died in infancy of diphtheria. A stray kitten, befriended by the children, must have been a carrier, at least that is what they thought was the cause. While Lizzie's parents attended the funeral of two of the little ones, Trilby, the lovely baby of the family died. Lizzie was at home with Trilby when she died. She and Charles had the heartbreaking task of meeting the sorrowing parents at the door to break the news as they returned from the funeral of the two other little ones. This terrible tragedy bit deeply into Lizzie and Charles' hearts and minds. It was at this time that Charles purposed to become a minister, which he eventually did. Lizzie threw herself into helping her father in his mission work. The Mission Hall was located right in the slums. The London City Missionary Society paid John Coles' salary to him. It was not likely a large salary, but sufficient for the needs of the growing family. It must also have provided a few luxuries, as Lizzie had a piano. Once a week she escaped from the everlasting household chores and rode across London in a double decker omnibus, tightly clutching her bus fare in one small hand, and her lesson money in the other. One day every week, the members of the Mission Hall supplied a big hot meal free to the poor down-and-outers. She helped the ladies scrub and cut up the vegetables--carrots, onions, leeks, turnips, etc. and also cut up a quarter of beef, which was donated by some wealthy patron. Barley, salt and pepper were added; then it simmered all day in big copper boilers and was doled out to the hungry parents and children. "Poor kiddies" she would say; but it was probably the best meal for them for a whole week! When their tummies were warmed and filled, John Coles would preach to them. Lizzie would play the little pump organ in those services and helped with the singing. She was her Father's right hand 'man'. Since she was needed at home to help her weary mother, she left the London Compulsory School for Girls at the tender age of fourteen, as she had completed all the requirements for girls: reading, writing, arithmetic, some French, some sewing, and of course, her music. Boys in those days fared better. Somehow two of her brothers, Alf and Tom, became proficient calligraphers, whose work was presented to King George at his coronation. It was a heavily illuminated something or other, and who knows, it may still be among that sort of momento in one of the palaces. These two brothers, as well as another named Jim, lost their lives in the World War One. Now, we come to the turn of the twentieth century...One bleak, wet day, four strangers knocked at John Coles' rectory door, asking permission to use the Mission Hall for a few weeks in order to have some gospel meetings. These workers were George Walker, William Irvine, Willie Weir and Eddie Cooney [Footnote 1]. Most of them were fresh over from Ireland. He explained that he couldn't pay them any salary, and they stated that Jesus didn't get a salary, and they didn't expect one either. He told them the congregation was poor and not much in the collection plate, so they told him they didn't take up a collection. He said they were welcome to use the hall. Where could she flee to? What could she do? She had not been prepared under his roof for any suitable career. She wasn't interested in marriage; she had seen enough struggles in her parent's home with the care of one baby after another and she didn't want that. Heartsick, but knowing her choice was the right one, she fled across London to where Bill and Maggie Carroll [Footnote 2] were having gospel meetings in an old used store building. They had heard the gospel in Ireland, and were enthusiastically carrying it to England, in spite of the fact that they were already married and had a baby, May, [Footnote 3A] when they heard and accepted the gospel. They received Lizzie, comforted her, and suggested that she stay and help them with the meetings. She did that, helping also with the baby and inviting people in the district to the gospel meetings. They all lived in the upstairs of the building and had meetings downstairs. It was during this time that the baby became very ill. The drafty storeroom and not enough nourishing food aggravated the situation. She watched Bill and Maggie arrive at the terrible decision to part with their little May in order to continue with the work. They took her home to Ireland to be raised by Mrs. Carroll. One can imagine the impression this made on Lizzie Coles! If these sensitive people could put the work of the gospel even before their own little one, how could she withhold her life from this work? It was arranged for her to join Bill's sister, May Carroll to be her companion [Footnote 3B]. May Carroll had begun in the work when she was eighteen [Footnote 4] and couldn't have been much older at this time. The two girls preached in the villages of Ireland. They visited the village folk on bicycles. Sometimes they were received but at other times potatoes or clumps of dirt thrown at them pelted them! They attended a convention at Crocknacrieve [Footnote 5]. This was one of the very of earliest conventions and lasted longer than ours. At this convention, an appeal was made for workers to go to America and Lizzie volunteered. Lizzie had been given a bag of oranges at their departure, which she shared with them all. In the course of time they arrived at New York and were met by Jack Carroll and George Walker [Footnote 7] and taken to a humble home of an Irish couple who had come to America to have a home for the workers. The one bedroom was given to the sisters; some of the brothers slept in the front room while the couple slept on the kitchen floor. The other brothers went to a local lodging house for the next few nights. They divided their belongings among them all and set off with brave hearts to preach the gospel. Each pair of workers had equal share of what monies and hymnbooks they had. In this way, the gospel began to be published on the eastern states and Canada. Lizzie and her two companions preached the gospel in New York, Pennsylvania and Ohio, but her companions eventually left the work because of the hardships. She loved it; the thrill of the work never left her. Sometimes they slept in schoolhouses they preached in, but they had people to preach to. They didn't have much money but had a whole lot of zeal! She was never very strong and her health was taxed beyond its limits. One night, after a meeting, she collapsed and the town doctor was called. He had been expecting a call at any time, as he had been listening and watching nightly outside the building. He hadn't wanted to come in to listen. After he examined her, he prescribed complete rest and a change of lifestyle. (A later test proved she had tuberculosis) Perhaps a farm where she could have nourishing milk and eggs and vegetables and not to preach until she was in better health. Well, there were no professing farmers yet! Upon the advice of George Walker, she was sent to a Mennonite collective farm. That didn't work out well, though, as there were about 20 marriageable young men, and although she was ill, she was still young and pretty. She asked George Walker for a change and several other places were tried, but none of them proved successful. Then the Hawkins family of Baltimore heard the gospel and embraced it. They opened their hearts and home to the workers. Immediately, they took in Lizzie, where, at last, she could find peace and rest. However long she stayed there, we do not know; we only know she did not recover so the workers felt she should return to England. Her father met her at the dock with this unkind remark "I knew you'd come crawling back to me." Although she stayed with him for a while, she was not welcomed there. Now, the Truth was new in those parts and no one seemed to know what to do with a returning sick warrior, so they did nothing. None of the friends reached out to contact her--they didn't seem to understand that she was too sick to go to meetings and she crawled into herself and tried to recoup her strength as best she could. Recovery was slow and years passed. Little by little she found means to support herself. She worked as a typist. She also worked for a time in a home for retarded girls, but that was hardly a cheerful occupation. Eventually she did what many 'gentry reared' Englishwomen did - become a 'nanny' to wealthy gentry needing a traveling companion for their children. In their employ, she traveled to France, Switzerland, etc. It was a safe, pleasant life. She found that she was much in demand, for she could teach the children French, music, and most importantly, manners. 1914: The storm clouds were gathering over Europe and World War One began. Lizzie, in the company of Dr. and Mrs. Ainsworth and their little daughter, sailed though the Mediterranean Sea to India, arriving in Bombay. She was entranced with the color, the people, the poverty, the riches, and animals roaming the streets, India's vastness. 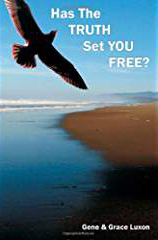 She wondered if the gospel could ever find inroads into this caste-shackled land? It wasn't very long until she was introduced to Lt. Charles Waddingham, band Master with the 8th Gurka Rifles Regiment. He seemed very debonair to her in his crisp uniform accompanied by his dog, an Airedale named Roger. Within three months they were married. Both were 30 years of age (Footnote 8]. Their interests were compatible, and they shared a mutual love of music. She would accompany him as he played his woodwind instruments: clarinet, saxophone, etc. They seemed to be very happy those first years in India. In 1916, Lizzie returned to London to give birth to her first born, John. On July 9, 1916, an air raid forced the family down to the cellar for safety. An incendiary bomb dropped on the house, going all the way down to the cellar, but didn't explode. John was born that night! Two years later, on June 1, 1918, Helen was born in Mussouri, India. A midwife called 'Lovely Mary,' who was happier and more skillful when she was slightly intoxicated, delivered her! In that bungalow, the crest of Mt. Everest could be seen against the sky. Charles sent Lizzie up to the beautiful cool station of Shillong in Assam, India, and that was where Jean was born. This place was over 7000 feet elevation, and there was a Hill Station Hospital there. In 1921 or 1922, Charles and Lizzie decided to leave India and return to England. Charles had spent 19 long years living in various parts of India and was fluent in the language. Lizzie had been there 8 years, and they had taught the children a little bit of Hindi, mostly nursery rhymes, such as Little Jack Horner and Humpty Dumpty, which we could rattle off easily in Hindustani. Upon returning to London, the War was finished, but so was the economy and the people were bitter and depressed. It didn't take them long to strike out for a more congenial environment: Canada. Already, Lizzie's brother, Laurence [Footnote 7] and sister Lou, and their families were living in British Columbia*. Charles and Lizzie and the children arrived in Canada at the port of Halifax in the Province of Ontario, (Note: Ontario should be Nova Scotia) and soon Charles got a job as the Leader of the City band. Those days any city of any size had a band. He also was a teacher of woodwind instruments in the college music department. They had arrived in the dead of winter, which meant in Eastern Canada, ice, snow and heavy winter clothing, and a complete lifestyle change for all the family. In India, though they were not wealthy, Lizzie managed a household of a minimum of 5 servants--one to cook, one to wash up after the cook; one to care for the horses, one to do the laundry, another to cut the grass, another to clean the house, etc, etc. Each servant had to have his own 'servant' to do the menial jobs! This was the caste system, and was routine. In Canada, Lizzie was plunged into doing the whole herself under great odds, with 3 small children and her own poor health. Charles was an impeccable Englishman, and expected three meals a day punctually served, complete with linen dinner napkins. Lizzie was often in tears. After a couple years of that, they journeyed across Canada, 5 days and 4 nights by train to Vancouver, B.C. There they lived in a nice little house within walking distance to Stanley School. John and Helen had already taught Jean to read so she began in second grade. More disciplined than schools are now, they marched in single file into the classrooms, with one hand behind their back while at their desks, unless required for handling the books or writing! The Depression was slowly creeping across Canada, indeed the whole world, and in order to augment their income, Charles and Lizzie played in the orchestra pit in the old silent movie house. Lizzie played theatre organ, while Charles doubled on clarinet, sax, etc. They had a standard repertoire of sheet music for cowboy movies and other thrillers: well known, dog-eared pieces of music to accompany Douglas Fairbanks Sr. and Mary Pickford. Their kids got in free every Saturday afternoon. Inevitably, they turned their thoughts toward the United States, and November 11, 1927 they moved to Longview, Washington, just as the great Depression hit in full force! Charles was lucky to get a job at Longbell Lumber Co. at four dollars a day, and this job lasted until the end of the Depression. As the country's economy slowly improved, so did theirs. About 1931 they moved to Ontario, Oregon, on the Idaho border, which is about 2100 feet above sea level, and Lizzie's heart reacted badly to the elevation change. From that time on she became weaker and weaker, but they stayed there for four years. By the summer of 1934, John had graduated from High School, and Helen completed her sophomore year and Jean her freshman year. The family doctor told them that Lizzie should be moved to sea level if she were to regain any health at all. Charles was not happy with this diagnosis, but Lizzie and the three children arranged to spend the summer in Portland, hoping the change would do her good. She had a little money left to her when her father died. The four of them rented an apartment near the Park across the street from the Portland Arts Museum. She enrolled the three children in summer art classes. Slowly, Lizzie regained a little strength and health. One day, while shopping in downtown Portland, she engaged in a conversation, which would change the direction of our lives. She and a lady shopper were talking, and as Lizzie often did, began talking about God having a perfect Way in the world. The lady said, "You know, I think you'd be interested in my sister's faith. I don't go in for it myself, but it sounds like you might be!" She also said that she would send her sister to visit her. Early the next morning, a Friday at about 7:30 A.M., one of the friends named Katy White came to see them on the way to work. She said she would arrange transportation for them to get to Gospel meeting that evening, if she would like to go. Lizzie said she would like to, but wanted to know who were the names of the Workers. Hugh Matthews and Allen Stephens didn't sound familiar, so she asked if there were any Carroll's or George Walker. "Oh yes", Katy said. All that day Lizzie was very moved, sometimes happy and sometimes apprehensive. She took the time to tell the children once again of her years in the work and asked them to listen very, very carefully when they went to the meeting. John elected to remain at home, and she didn't force the issue, but she, Helen and Jean went to the meeting. They were taken to a tent meeting in Milwaukee, a suburb of Portland. It was nearing the close of the mission and Hugh Matthews spoke that night on the crucifixion of Christ. The girls had never before heard any preaching like it. In closing the meeting, he tested it, and both girls stood to their feet, while Lizzie quietly rededicated her life to Jesus. Hugh asked the girls to put their decision into words and Jean stumblingly said, "I want Jesus to become my King, as well as my Savior." At last, Lizzie became reunited with the Great Family from which she had become separated, in those early days in London. Well, she was never to be separated again! She lived twelve years to the day, with full and sweet fellowship with the friends in Portland. The next day Hugh came to see them, and he told Lizzie that he had recognized her the minute she came into the tent! He had never forgotten her from those early days in Ireland at the turn of the century. They had a very happy summer--wonderful in every way, but at the end Charles sent for them to return to Ontario to go to school. Some very hard times followed and Charles was very angry with Lizzie, and furious with the girls for accepting "Their Mother's Religion." Those were very hard years, but years in which they learned to trust in the everlasting strong arms of a Heavenly Father, who was always there to sustain. The Bible became real and living and vital, and the meetings were sweet and nourishing. Lizzie was never strong after that, but was just able to care for the house and get to meetings until the day she died. TTT Editor's Note regarding the author of the above account: John VanDenBerg, who currently (2009) labors on the Workers staff of California is the Grandson of Elizabeth Coles. He wrote the TTT Editor "the written account of Grandma's testimony was dictated by her to both of her daughters, my mother, Helen and my Aunt Jean." 1905 Workers List: John VanDenBerg also stated that Elizabeth Coles was also called both Lizzie and Lily. The 1905 Workers List shows Lily Coles entering the work in 1903. NOTE TO READERS: There are several discrepancies apparent when this story is compared with other well known, recognized, documented facts about the Coles family history, the 2x2 church and workers. See Footnotes below for details. DISCLAIMER: Please understand that the TTT Editor is NOT stating the Account reprinted above is false by any means, and is NOT attempting to belittle, disparage or discount the life or family of Mary Elizabeth Coles. The Editor's goal is to provide truth and accuracy in the area of 2x2 history. This Account is published on Nathan Barker's website "Topics in the Bible" and may cause some readers to be misled or to base conclusions on inaccurate information. Therefore, the TTT Editor found it expedient to publish this Account and to add Footnotes showing some details given in the Account are not consistent with other known documented facts, and allow the reader to choose what they wish to believe concerning the matter. The Editor suggests these discrepancies are probably due to the Author of the Elizabeth Coles' Account estimating or incorrectly recalling some dates; or possibly the typist or note taker made some inadvertent scriveners errors. 1. There is a discrepancy in the year (1899), when the four workers allegedly came to Rector Coles' door. According to the 1905 Workers List, (the earliest Workers List presently found in existence), only two of these four men were preaching at that time. George Walker went in the work in 1899, and Wm. Irvine was preaching for the Faith Mission until 1901. Ed Cooney didn't enter the work until 1901, and Willie Weir didn’t go in the work until 1903. Yet this account states Lizzie Coles professed through these four men on May 1, 1899. It wasn't until October, 1899 that The Bicycle Boys (George Walker was one of them) ventured to Scotland on their FIRST experimental expedition. 2. There is an unaccounted 2-3-year period of time that elapsed from the time Lizzie's Father kicked her out of her home until she went to live with the Carrolls. The Coles Account gives the impression that Lizzie fled immediately to the home of Bill and Maggie Carrolls on May 1, 1899, the very night her father turned her out of his home. This conflicts with the date Bill and Maggie Carroll were in the work in England when Lizzie Coles stayed with them and helped take care of their baby daughter. According to the 1905 Workers List, Bill and Mrs. Carroll didn't go in the work until 1903. In addition, Bill Carroll and Maggie Hastings did not marry until June, 1901, two years AFTER Lizzie Coles allegedly went to live with them. They were married in the Church of Ireland in 1901, with Jack Carroll and May Carroll being their Best Man and Maid of Honor. Maggie became pregnant two months after they married, and May was born 11 months later in May, 1902. Maggie was pregnant during the year 1901 and part of 1902, and unsuitable to be a work at that time. Ed Cooney attended the Carroll's wedding in 1901, and when he left their wedding, he became a worker. It's a well known documented fact that Cooney entered the work in 1901. 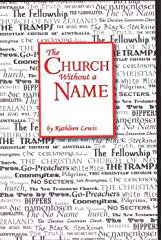 See Patricia Roberts book: The Life and Ministry of Edward Cooney, pages 19-20. The Irish Census taken on March 31, 1901 showed William (Bill) Charles Carroll (not married), his mother, Cecelia, and his sister Cecelia Primrose living at House 1 in Rahinstown, Co. Meath, Ireland. On the other hand, in June, 1906, Lizzie Coles' father told the Morning Leader reporter: “Three years ago...Mr. Irwin [Irvine], Mr. Cooney and five others held meetings at my mission hall under the auspices of the London City Mission." "Three years ago" would be 1903--not 1899. It appears the year 1899 in the above account is incorrect, and it is far more likely that Lizzie professed in 1903. 3A. There is a discrepancy in the date of birth of Bill and Maggie Carroll's baby daughter, May. By this Account, she was already born in 1899, and Lizzie Coles took care of her. However, her tombstone records that she was born on May 31, 1902 (View photo of tombstone); and according to the Hymn Author List prepared by workers and friends, she was born in 1902 in Ireland. The baby, May, would later marry Adolphus ("Dolph") Shultz, and reside in Australia. 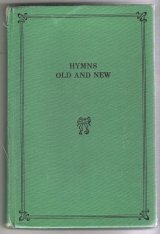 May wrote some of the hymns in Hymns Old & New. The Review of Hymns (for 1951 Edition) states: "Mrs. May Shultz (nee Carroll) of Melbourne (Australia) has written a great many hymns. From her collection we have the following: Nos. 203, 219, 280 and 290. Some of her hymns make very nice solos, but, as already mentioned these are not included." 3B. 1905 Workers List: The 1905 Workers List shows Lily Coles entering the work in 1903. Grandson, John VanDenBerg, also stated that Elizabeth Coles was also called both Lizzie and Lily. 4. Mary (May) Georgina Carroll (sister of Bill Carroll) was born September 2, 1879 at Newtown, Moynalty, Kells, Co. Meath, Ireland. She became a Pilgrim Worker for the Faith Mission when she was 20 years old (not 18 yrs old, as stated in Coles Account above), according to the Impartial Reporter Impartial Reporter January 15, 1903. Eddie Cooney wrote a letter to Alice Flett: "He (Wm.Irvine) was at that time Pilgrim Irvine, a preacher in The Faith Mission into which May Carroll entered and in which she preached for some time AFTER being won to Christ by William Irvine." May Carroll spent three years preaching as a Pilgrim with Faith Mission, and left when she was age 24 in 1903. View Photo of May Carroll. Miss Tillie Thompson, Secretary for The Faith Mission, wrote: "Mae Carroll joined The Faith Mission on October 11, 1899, and it is intimated in our magazine that she left in November, 1903, and 'joined Mr. Irvine's band of workers.' We can find no record that any other members of the Carroll family were in The Faith Mission." (Letter to Cherie Kropp dated October 30, 1991). May Carroll's name appears for first time on their 14th Annual Staff of Workers List, having joined with Faith Mission on October 11, 1899 (See FM Periodical: Bright Words, Nov/Dec, 1900). So if Lizzie Coles and May Carroll were companions in Ireland in 1900, did Lizzie become a Faith Mission worker also?? If so, why isn't her name shown on the Faith Mission Workers Lists, which they published bi-monthly? 5. The Account states May Carroll and Lizzie Coles attended a convention at Crocknacrieve, one of the earliest conventions. According to other sources the FIRST convention ever held at this location in Ireland was in September, 1904: "John West, Crocknacrieve, Ballinamallard, near Enniskillen, gave his premises for a Convention that year. William Irvine had newly returned from the United States; and was in good form." (From John Long's Journal). The Enniskillen Newspaper, named The Impartial Reporter, reported details about the convention (Impartial Reporter, September 29, 1904, October 27, 1904. 6. The letter from George Walker mentioned in this Account concurs with a document titled "George Walker's Early Days in America--as related on Monday, October 29,1979," in that three of the men's names for those who arrived in America in December, 1904; which stated: "In May 1904, Jack Carroll, Sarah Rogers, Jean Weir, and several others arrived in this country, and again in Dec. 1904, a group including Jack Jackson. Willie Weir, Dave Linus (should be Lyness), and others came." A copy of this letter would be welcome. According to the records of the American Family Immigration History Center at Ellis Island at: http://www.ellisisland.org , there was a female passenger listed as Lizzie M. Coles, 26 years of age, Single, Servant, Irish; Residence, Norfolk; Departing Nov. 30, 1904 on the Ship Oceanic, from Liverpool, England, U.K. Her age fits perfectly with her birth day given in the this account (1904 minus 26 years = 1878). This passenger arrival date of December 8, 1904, is within one day of Jack Jackson's statement regarding a group of workers who departed from Liverpool, England in November, 1904 and arrived in New York on December 9, 1904: "It is a good while ago now that one morning towards the end of November, 1904, my companion and I were in the east of England and were preaching there...and a knock came on the door and a telegram came for me, "Be in Liverpool Tuesday and sail for New York Saturday. That was short notice....well we landed in New York on the 9th of December" (Jack Jackson at Freedom, NY Convention Notes November 14, 1960). 7. The Account erroneously gives Lizzie's brother's name as "Laurence Coles" who was already living in B.C. Canada. Reportedly, this brother's name was not Laurence, but was really Herbert John Coles. According to his granddaughter, Barbara O'Hagan, "I was surfing the internet to find out about my family tree. My maiden name was Coles. I read your account of Lizzie's life. A mistake was made in the names of the two who came to Canada before her (Lizzie). They lived in West Vancouver, B.C. Their names were Lou, as stated, and her brother whose name was Herbert John Coles (my grandfather). He has a son Herbert Laurence Coles who is still living in West Vancouver and is 86 years old and had nine children, of which 7 are still living, and also has 18 grandchildren spread around the world." 8. The Account states that after she went to India in 1914 she met and married Charles Waddingham and they "both were 30 years of age." However, in 1914 Lizzie would have been 36 years old--not 30. Married Margaret Clark on October 25, 1904; married Catherine McLeod Nov. 19, 1942. FIRST SISTER WORKERS: Some have alleged that Mrs. Bill (Maggie) Carroll was the first woman preacher, since this Account implies that she was preaching in 1899. However, the 1905 Workers List. shows she and her husband Bill both entered the work in 1903. It is also sometimes assumed from this Account that Lizzie Coles was in the work prior to 1900. The above discrepancies show that its highly unlikely that either of these women were sister workers in 1899. NOTE: Wm. Irvine's name is often misspelled "Irwin" in newspaper accounts, and it in this one. Some fresh light was thrown on the sect of Tramp Preachers yesterday, concerning whom several articles have recently appeared to these columns. 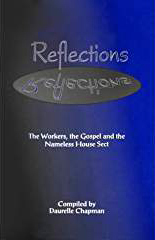 The gentleman who volunteered the information was Mr. Coles of Leytonstone, a missionary belonging to the London City Mission, whose daughter has for three years been one of the “tramps.” Mr. Coles himself is a devout believer in the Sect, and offered an emphatic defence of their methods. At the outset he denied indignantly the charge that girls are decoyed away by the "Tramp Preachers,” and cannot be heard from after. His own daughter, now in America, communicated regularly with him, giving full details of her life, and her accounts had been confirmed from an independent source. 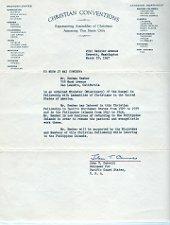 By way of proof Mr. Coles placed a batch of the correspondence in the hands of the “Leader” representative, which showed the young lady to be in a happy frame of mind. Moreover, Mr. Coles stated that the girl has an uncle in the United States--a deacon of a church—who also reported favorably about her. “Three years ago,” he continued, "Mr. Irwin, Mr. Cooney and five others held meetings at my mission hall under the auspices of the London City Mission. One of my parishioners had suggested it. He said that they would preach the gospel, and they did preach it. It was as a result of this three weeks’ mission that my daughter joined them." “Yes. But perhaps this will help you to understand what is done. Two years ago they had a conference in Ireland at which my daughter was present. My daughter told me that they met according to the apostolic teaching in Acts. Everybody, whether he had much or little put it into the common stock: and then the total collection was distributed equally among those present. "So that it may have been—mind you, I am not sure—that at that time Cooney brought in several thousand pounds." The conference then separated, each going to his or her duty. “That," said Mr. Coles, "is how they work." Mr. Smith does give up the money, and any more he can spare. The girls sent to America go about in pairs and support themselves in the way described. What the leaders of the movement say is that those people who can't collect money are failures. In June, 1906, John Coles told the reporter: “Three years ago...Mr. Irwin, Mr. Cooney and five others held meetings at my mission hall under the auspices of the London City Mission." "Three years ago" would be 1903--not 1899.